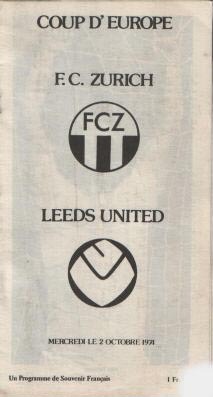 Date: Wednesday, 2nd October 1974. Venue: Letzigrund Stadium, Zurich, Switzerland. Competition: European Cup First Round Second Leg. Scorers: FC Zurich: Katic, Rutschmann. 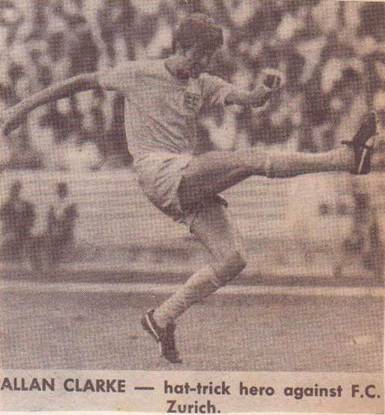 Leeds United: Clarke. 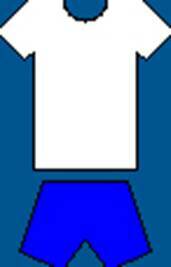 FC Zurich: Grob; Heer, Rutschmann; Zigerlig (Marti), Bionda, Kuhn; Martinelli, Katic, Jeandupeux, Stierli, Botteron. 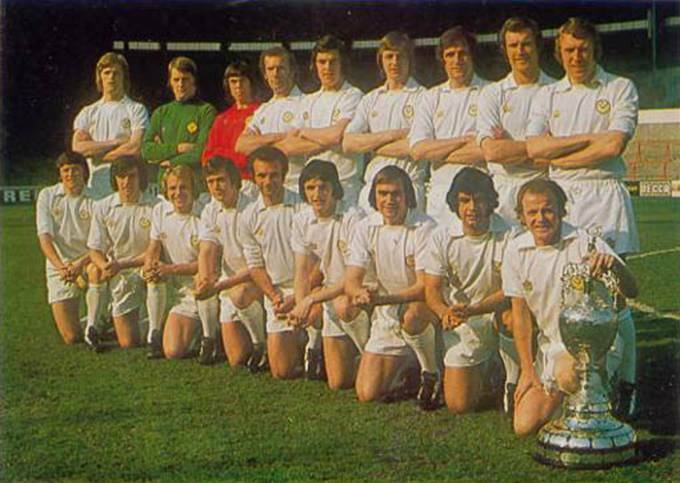 Leeds United: Harvey; Reaney, Cherry; Yorath, Madeley, Hunter; Lorimer, Clarke, Jordan, Bates, F. Gray (Hampton). 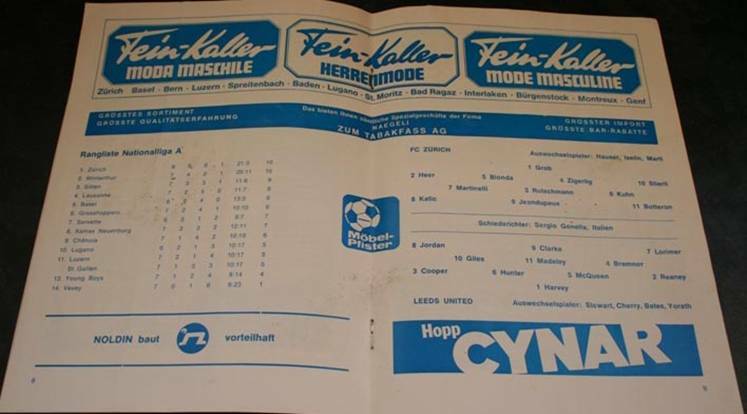 United were still under the control of Maurice Lindley and Syd Owen, the temporary caretaker managers but the team but did enough to get through to the Second Round when they held FC Zurich to 1-2 and they progressed, 5-3 on aggregate. United were on the brink of naming Jimmy Armfield as the successor to Brian Clough and the respected safe pair of hands were on the managerial reins as United flew into Zurich. 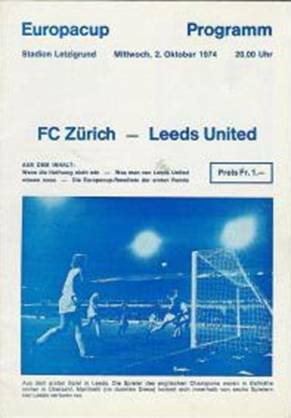 Allan Clarke gave Leeds the lead after thirty-six minutes but Katic scored almost immediately to level the scores on the night and when United conceded a penalty two minutes before the interval, which Rutschmann duly converted, things could have got away from United. They then shut up shop and FC Zurich were not able to increase their score and United were comfortably through to the Second Round. With a 4-1 lead, United were conservative in their approach to the game, particularly as they were without Billy Bremner, Terry Cooper, Johnny Giles, Eddie Gray and Gordon McQueen. 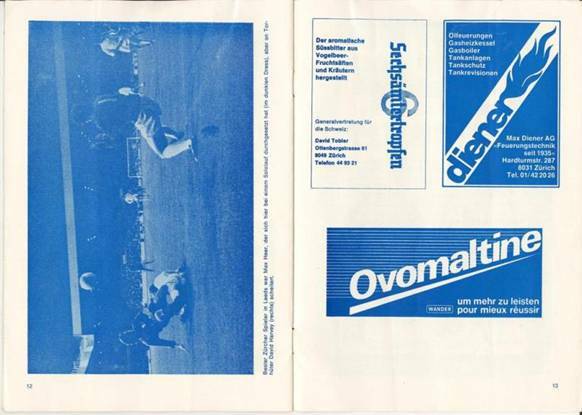 However with players of the calibre of Terry Yorath, Trevor Cherry, Mick Bates, Frank Gray and Paul Madeley to take their places the damaged done by their absence was limited. Zurich set the pace in the first half and David Harvey needed to be at his sharpest to deal with an effort from Daniel Jeandupeaux but chances for the home side were scarce. 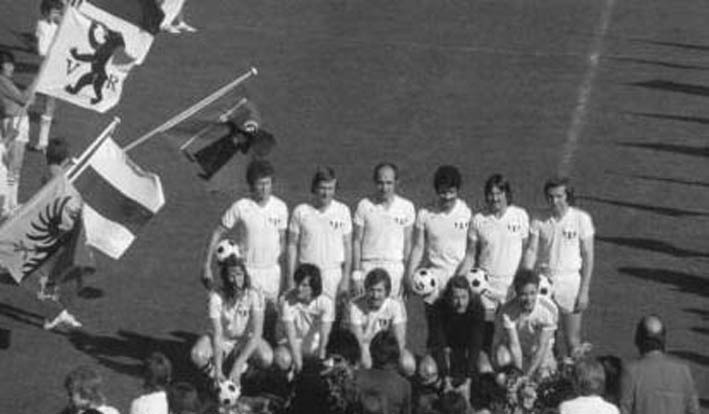 After thirty-seven minutes United strengthened their hold on the tie even further when David Harvey launched a kick deep into Zurich territory, Allan Clarke read the ball perfectly, went past two defenders and clipped home a left foot shot for his tenth goal in eleven games. Rather than cave in, Zurich hit back from the kick-off. Hilmar Zigerig and Rosario Martinelli opening up the Leeds defence for Ilija Kutic to fire in the equaliser on the night just less than a minute later. Leeds seemed to panic at that stage and David Harvey was forced to make a brave save at the feet of Daniel Jeandupeaux and, although the Leeds keeper received a bump on the head in that incident, he still managed to pluck a dangerous Ilija Katic cross out of the air moments later. 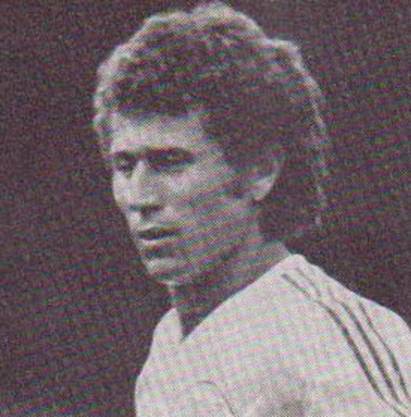 Three minutes before half-time United found themselves behind on the night when Paul Reaney brought down Daniel Jeandupeaux in the penalty area and Ernst Rutschmann thumped in the resultant spot kick via the bar. Leeds regrouped and were able to kill the game off in the second-half as the tie petered out and United went through into the Second Round on a 5-3 aggregate. Front Row: Rene Botteron, Daniel Jeandupeaux, Max Heer, Karl Grob, Jakob Kuhn. Norman Hunter, Paul Madeley, Mick Jones. Terry Cooper, Mick Bates, Billy Bremner.